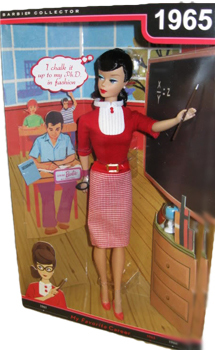 Barbie Student Teacher Reproduction, Collectable Barbie Dolls"
Barbie Student Teacher Reproduction is a Collectable Barbie Doll that was released for 2010 in December 2009. 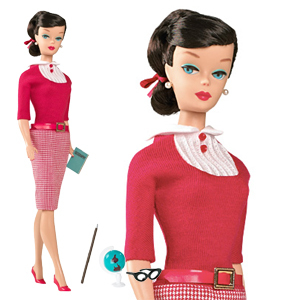 This is part of the "My Favorite Barbie" series that began in 2009 to celebrate Barbie's 50th Anniversary. Some of the 2010 dolls are called "Barbie's Classic Careers", including Student Teacher, Registered Nurse, Miss Astronaut and Pan Am American Stewardess. All of the My Favorite Barbie boxes have the date of the original on the upper right hand corner.